Looking for some inspiration for your fall décor? I’ve got you covered! 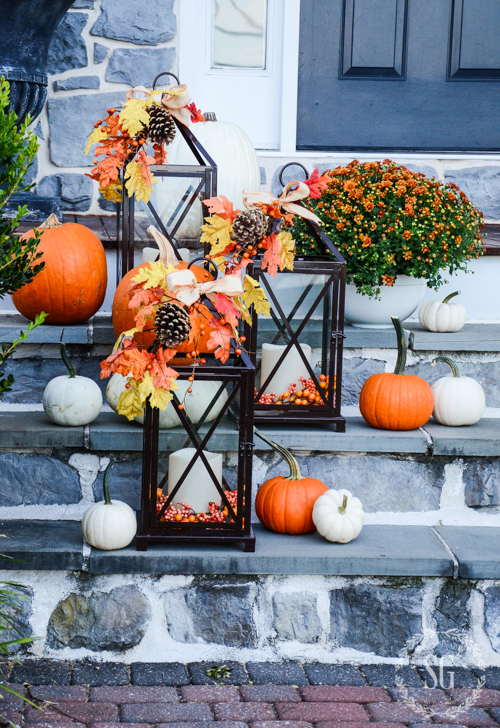 Read on and get inspired by these outdoor fall decorating ideas below. Ring in the season by giving your home’s facade some fall-ready curb appeal. Just add some natural elements like dried floral arrangements, rattan, twigs, corn stalks and of course pumpkins, and viola, your outdoor fall decor makeover is ready! Do you feel the fall season? Once you feel the first crisp breeze, you know that summer has ended and fall is in the air. Everything changes during autumn, from the clothing choices, home decor, and getting ready for fall parties. And I have to say, home decorating is perhaps the first thing you should consider as it sets the mood for autumn. 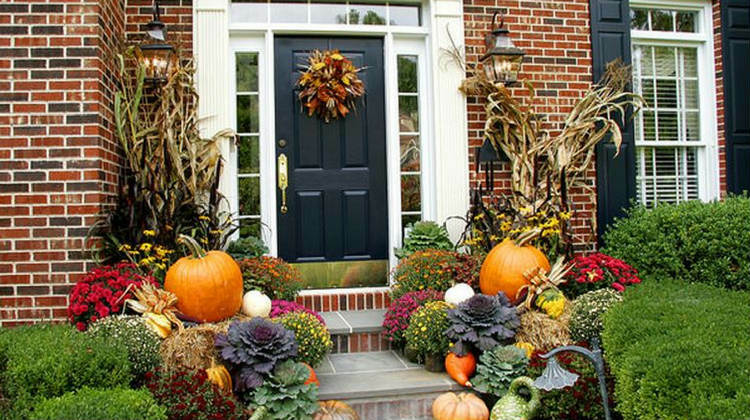 Go all out with your outdoor decorating ideas with pumpkins, corn stalks, and gourds strategically placed on your walkway which complements your front door decorations. And just like that, your outdoor is ready for autumn! Today, I am showing you 10 outdoor fall decorating ideas and see how easy it is to spruce up your outdoor for fall! This DIY Mason Jar Lantern is so easy to make, and it looks so lovely at night. See how you can make it here. Using an obelisk as a basket for all the gourds is a perfect idea. It’s a great way to add height. Further instructions can be found here! I love the idea of putting a basket of apples on the door instead of a traditional wreath. This apple-themed front porch is very creative and it looks very welcoming! Plastic pumpkins are easy to find and inexpensive, which makes this a must-try. It looks very pretty for fall, don’t you think? See more detailed instructions here. This is an easy way to dress up your porch and make it pretty, both day or night. Further instructions can be found here! The beautiful rich color of the rusty orange mums perfectly coordinates with the chocolate browns, metallics, creams, and caramel colors in the wreath. Settingforfour shares the detailed instructions here. I just love the warm and rustic touch these reclaimed wood pumpkins add to the outdoor decorating. 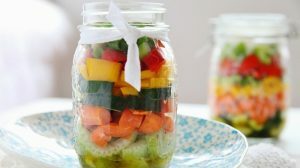 This is definitely a great no-cost fall project to do over the weekend. Making a fall-themed grapevine wreath is so easy and fun! Follow this tutorial and you’ll be able to create your very own fall-themed wreath that’s worth hanging around. I love how the lantern works with the orange of the pumpkin and the color in the crate. This is a perfect fit for the front porch. I so love the metallic sheen to some of the pumpkins. I say, simple pumpkins just need some shiny metallic paint to transform them into even more beautiful things. Bring the warm colors of fall into your home with these fabulous outdoor fall decorating ideas. Hope these great creations inspire everyone to make something special on their fall decorating. Enjoy! 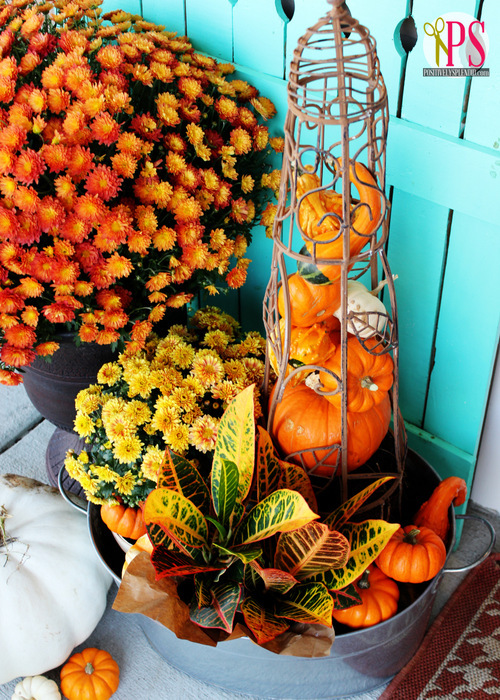 Which outdoor fall decorating idea is your favorite? Let me know below in the comments! Follow me on Instagram, Twitter, Pinterest and Facebook! Want more DIY fall decorating ideas? Grab 18 fall wreath ideas for your front door here!